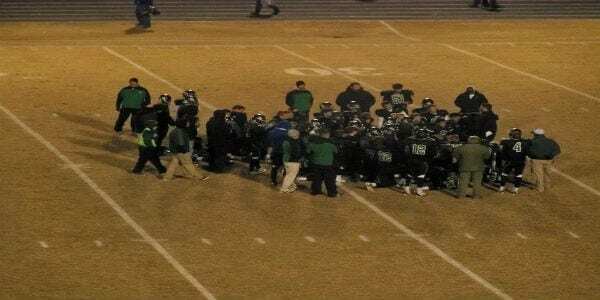 The Pickens High School Dragons football team looked to make history as welcoming in the #3 team out of 8AAAA, the Stephens County Indians, to Dragon Stadium for a first round match up in the 2014 GHSA football playoffs. The Dragons came into the game at 8-2 and the Indians at 7-3. This marked the seond time in school history that Pickens hosted a playoff game and the first playoff game for the school since 2005. A win would be the school’s first in the playoffs; however the Indians proved to be too much leaving Dragon stadium with a 42-14 win. Stephens County won the toss but differed to the 2nd half giving the Dragons first crack at points. Pickens once again broke out the new black uniforms as the players took the field for the first time on offense. Despite Pickens pulling out a fake punt for a first down, and another first down run from quarterback, Marcus Byrd, the offense was unable to get points. Defense took center stage for the majority of the opening quarter as Stephens County found pay dirt after a three yard run at the 4:05 mark in the first, giving the Indians a 7-0 as the game progressed into the second quarter. Stephens then added another score to that lead with a 12-yd run, just 46 seconds into the second quarter stretching the lead 14-0 with 11:14 left in the first half. The Dragons cut the lead in half after a 1-yd run from Shannon Brooks at the 8:56 mark making it 14-7. Stephens County added two more scores before the half to make it 28-7 as we went into halftime. A 28-yd run from the Indians gave Stephens a 35-7 lead with 6:45 to go in the third. Stephens then added an 11-yd run at the 3:47 mark to make it 42-7 as the game headed into the fourth quarter. Chris Pittman found his way to the end zone after a 10-yd run at the 10:16 mark to make what would be end up to be the final score of 42-14.